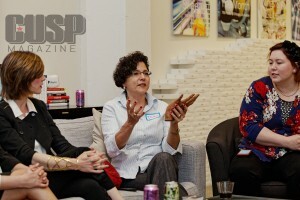 “Tech for Entrepreneurs: Where to Start” was hosted by Ms. Tech and Belly at their River North headquarters. Small business owners supporting each other is right in line with our credo at CUSP Magazine, so of course we had to attend the event. CODFIDENT will be an ongoing series with different panelists sharing the common bonds of entrepreneurship and education. CUSP Magazine will bring you the details for upcoming CODEFIDENT events and locations.